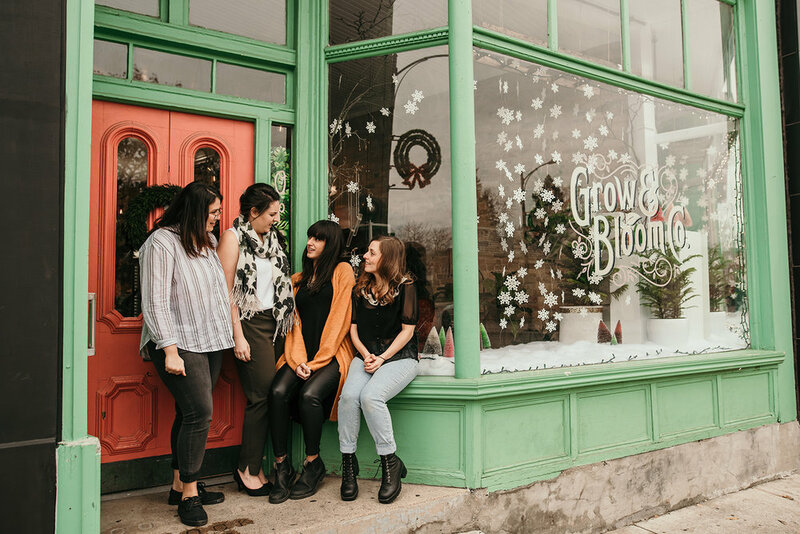 About — Grow & Bloom Co.
An earthy and whimsical botanical boutique on London, Ontario’s Richmond row specializing in indoor plants and supplies, terrariums, local goods and bespoke floral creations. EST 2017. Here to inspire. Founded in the spring of 2017, Grow & Bloom Co. evolved from the love of horticuture and floristry. It’s purpose is to inspire and help re-connect people to nature, while creating not only a retail space to house all things botanical but also to create a work space for like minded individuals to explore and build on their creative talents. We also strive to serve as a support hub for local trades people and artisans to showcase and sell their wares. At Grow & Bloom Co, we specialize in indoor plants and maintain a large curated selection which often changes weekly. The hunt for new and unusual varieties never stops! When we aren’t searching for new stock, we are upstairs in the studio designing florals for special events or teaching workshops, interiorscaping and floral design. We also offer citywide delivery, in-store potting services, horticultural consulting, special event and other plant related advice. Founder and in-house horticulturist, Robin is a graduate from the Fanshawe College Horticulture Technician program and has over 15 years of experience in her field. Her love of plants and creative abilities led her to create a space where she could explore her passions authentically while helping others connect and create with the natural world. Robin originally started her business under the name Botanista and spent many years working the local pop-up circuit selling her botanical creations before opening Grow & Bloom Co. A lover of all things wild and whimsical. Robin specializes in botanical resin jewelry, preserved wedding flowers, living walls, moss frames, terrariums and is now exploring the world of floral design. One of her favorite things is pairing plants with unique vessels and is always available to assist with plant questions or offer suggestions. Growing up in the countryside, surrounded by farms and forests, Erin has always been drawn to the shapes, textures and colours of Mother Nature. Now, with over six years of experience as a floral designer and wedding consultant, Erin loves sharing her long standing passion for creating dreamy wedding/event details and designing romantic, garden inspired florals with her diverse clientele. With 15 years in customer service, she has dedicated her career to creating positive, unique and personal experiences for every individual that walks through the door. An animal lover, avid reader and self- proclaimed "chatty Kathy," Erin believes in the importance of creating lasting and impactful personal and professional relationships, and hopes to empower, educate and encourage her fellow botanical enthusiasts one flower or plant at a time. As an Alberta native, Elizabeth attended the Alberta College of Art + Design for 3 years before moving to the lush, forest city of London. Following her love of creating, and a deep reverence for nature, she came to Grow & Bloom Co. Elizabeth feels It's a magical place that enables her to connect and collaborate with nature through the Floral and Botanical Arts. Her desire is to create pieces that bring joy and help facilitate a connection to Mother Earth. With a deep love of nature and all things wild, Julia, who grew up exploring the forests and lakes in Windsor is the newest addition to the Grow and Bloom Co. team. Emerging from a background in photography & the arts, Julia has found a new creative love for art in its most natural form. The beauty of nature itself is what has drawn her to explore the world of floral and other botanical design. She especially loves making terrariums and deepening her knowledge of the ever changing varieties of plant life we stock in the store.